Guernsey FC boss Tony Vance says he is "really pleased" for goalkeeper Leroi Riley after he made his debut in their 2-0 FA Trophy defeat at Thurrock. Ross Wall scored both goals in the second half for the home side, who play in Isthmian League Division One North. The Channel Islanders needed four wins to reach the first-round proper, but have fallen at the first hurdle. "I'm pleased and proud of him, he's done well in a pressurised situation," boss Vance told BBC Guernsey. "He handled it fantastically well, came for crosses and had an excellent game. "He hasn't had much reward but now he's got some and I'm very pleased for him." 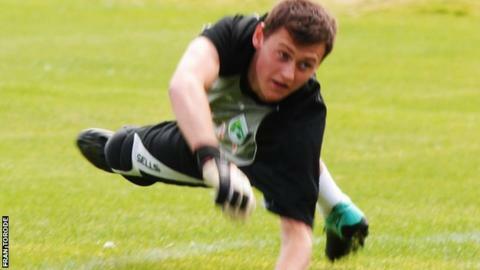 Riley, 23, has been behind regular keeper Chris Tardif in the Isthmian League Division One South team's pecking order. The FA Trophy result means Guernsey have not won away since the opening day of the season, but Vance remains encouraged by what he has seen. "We had some really good chances," he said. "I thought Ross (Allen) played his lone striker role fantastically well and everyone else joined in, and we managed to frustrate them and force them into errors."